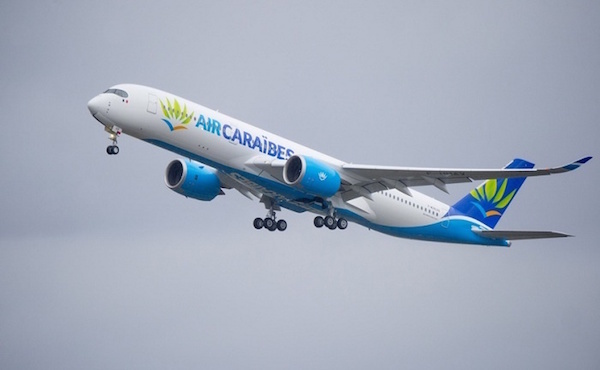 Air Caraïbes has taken delivery of its first A350-900, opening up a new era in air transport in the French Caribbean. With this latest delivery, Air Caraïbes becomes the first French airline to operate the A350 XWB. The aircraft, leased from AerCap, was delivered during a ceremony held at the Airbus Delivery Centre in Toulouse. The A350-900 can accommodate 389 passengers in a three-class configuration. Air Caraïbes plans to operate its A350 XWB alongside the A330s it already has in service on its Paris-French Caribbean routes. The A350 XWB benefits from the latest technological and aerodynamic innovations offering an unprecedented level of operational efficiency while significantly cutting its environmental footprint. Its fuselage and wings are made of carbon fibre and it is powered by the new-generation Rolls-Royce Trent XWB engines. To date, orders for 821 A350 XWBs have been placed with Airbus by 44 customers around the world, making this one of the most successful programmes ever in the long-range aircraft segment.